Restoran Kam's kitchen , started off as a little Tai Chow, situated under a huge tree in Kampung Cheras Baru , off Jalan Kuari. To be more exact they were situated only outside of Poh Yep (famous door manufacturer). They opened only at night. They have now moved to the shops next to the big tree now. Kam's famous for offering simple food which tastes good, small servings, and reasonable pricing. It has become a joint where I could go have a quick dinner with mum and dad. I mean just the three of us, if you wanted a variety of dishes , but don't wanna stuff yourself up too much, this restaurant's the place to eat. A vegetable dish is priced from RM6, meat from RM 8, and fish ( very reasonable). Usually we'd just come by and order one Vege, one Fish , One Meat, and maybe a Chicken Dish... but two weeks back, we just wanted to try out something a bit special from them. We ordered a Steamed Cod Fish, Mutton Curry, Nai Yau Prawns, and Fried Brinjal. We ordered COD fish, because we thought it would be nice to see if they can do fish nicely. It turned to be pretty good. The meat was firm, and the gravy wasn't done badly at all. Have had better, but at this price, I think one of the best. It was a surprise for me that Mom & Dad decided to order Mutton Curry... I was skeptical as to whether chinese chefs know how to cook mutton or not.. but as it turned out, I thought they could have prepared the mutton a little bit better. Their Nau Yau Har, was by far the best dish, in terms of taste. The combination of ingredients, definitely make this dish a very appetizing one, unless the cook, dunno how to prepare it. There was only one way to improve on this serving .... bigger prawns. This pic was a bit blurr, I must have moved my hand . Its one fantastic dish,. I don't really remember what dish they call it, but its brinjal something. Its not a common way to cook brinjal, but the end result... it turned out grreeatt !! These fellas are not a fancy restaurant, and they do well because they cook decent food, variety, and good pricing (but serving size also smaller). 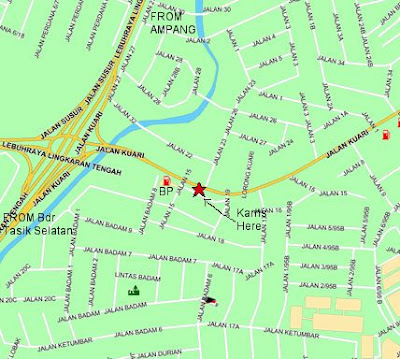 Assuming you are coming from MRR2, use the Jalan Kuari roundabout and turn left ( From Ampang ) . Go straight and keep right. You will reach a BP station with traffic lights. Turn right , and go up the hill, and turn left on the second junction. The restaurant should be there. This place serves the best Hakka Laksa Lemak with cockles in town! Open only at night and closed Wednesdays. The wantan and sui kow with its simple preparations, bring back memories of how purity tastes. The ABC or air batu campur is like what we used to have at the canteens in school years ago. Just lots of shaved ice, syrup, evaporated milk, corn and red beans. That's all we need, right?! Their curry noodles, comes with tau fu pok ( something made of soya bean), a few pieces of chicken, taugeh, and cockles. The curry broth was okay la. A little too watery for my liking. I thought the really good curry laksa like the ones served by Red Ginger ( i think its Rm12.90 per bowl), of which those curry is kao kao wan.... but then this stall sells a bowl at RM3.50. That night we visited, there wasn't enough gula melaka.... but it still tasted quite ok. Now this stall also serves, Pan Mee, Ching Tong(clear soup), and various types of kon lou noodles. Their curry mee is pretty good but I am sure its not the best (have had better). 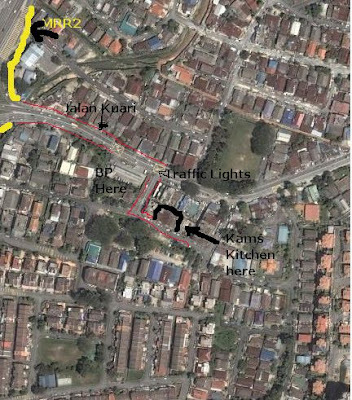 Drive from Loke Yew towards Taman Cheras ( Yulek). Take the Taman Cheras round about, from KL means to take a left. You will reach one traffic lights, keep right , and turn right. Then you will arrive at the BP traffic lights, there you go straight. You can keep left or right, both lanes also can go straight. You will follow that road and you need to drive past 7-11, and the Yulek Market (along the blue highlighted road) until you reach the junction. Was at Suzi's sometime earlier this month. It was just an impromptu decision to go over to Suzi's, as I met up with a client and was having a drink at Pelita, near Ampang Point. It just struck me that, the fler is from Penang, tak kan pula I belanja him Nasi Kandar , right ? So I suggested to him, got one place, Steak very nice... he said ok , why not.. We got up the car, left the car park outside Pelita, and took an inch by inch roll down to Suzi's. It took us 20 minutes. So its true, Suzi's has become an Expat's mamak. Its good to see those Mat Salleh's letting their hair down, eating food a cheap stalls like Suzi. Really have to go see to believe. I also wondered, why the Mat Sallehs love this place so much. I went down to Suzi's to try their Steak , so I ordered my steak. My client, ordered his chicken chop and so did my colleague. Mine was a Sizzling Black Pepper Steak (asked to cook to Medium Well). I wasn't expecting very much from my steak, especially from a place like Suzi's even though I heard a lot about their reputation of serving mouth watering steaks. Ya but reputations are just reputations, nothing much. I sliced a piece of my steak, revealling a juicy, really cooked to Medium Well piece of meat. Wow, I am already impressed. However, so , since I am not a steak connoisseur, I don't really know which cut was served. But I happilly chowed down the steak. Gotta say, their sauce is quite good too. I think the chicken chop is okay, although I usually just never chicken chop when I go out and eat. Good steaks, I must say they tasted above average... what a surprise !! One lady who's been there..
Know your Hitzstory - taking stupidity to a new level !! Every morning we get brain washed as we get stuck in the crawl on the way to the office. Although I only get the last ten minutes of their stupid jokes ( stupids but I likes it)... I have already been brainwashed and now I become a zombie walking around preaching Hitzstory 101. The Morning Crew: Did you know, in 1957, Hitz.FM was called the Hitz.AM ? General: [refraining from laughing] OH !!!!!! If you are looking for a nice environment, decent food, and a fairly cheap place to eat, do come to CODO. Its situated on the 3rd Floor of MidValley, and definitely one of those places that I frequent. I remembered I had dim sum set the first time I ate here. I was quite impressed and somehow there was some kinda draw, and I kept coming back since. I liked the decor of this restaurant. Its a fusion of chinese, traditional kopitiam and romantic. Plus, this restaurant is situated on top of a busy 3rd Floor Podium area of MidValley, which is not as noisy as the restaurants below. Additionally, you do not get passer by's stopping to watch you eat. The lighting is dimmer than most kopitiams or restaurants which serves dim sum, but bright enough to take a business associate out for lunch. They also have booth tables which gives you that kind of privacy you wish for a business lunch or a romantic date. For some reasons which I can't pinpoint at, this restaurant has got a fairly low noise level, which adds to the plus points. Well, in the most recent visit, we tried their SET Lunch for Two, with Fried Rice, Beef Noodles (phoa - ya quite authentic) and three side dishes. I thought the noodles were pretty good and so was the fried rice ( although not very special). Their side dishes are always very special, but not to be mistaken for being authentically Vietnamese. Okay, those were the dishes we had recently, but trust me, you should try their Chargrilled Lemongrass Beef. This dish reminds me of Philly Steak marinated with Lemongrass... whoa... jieng !! The second thing I thought you have to try is their Dim Sum set. 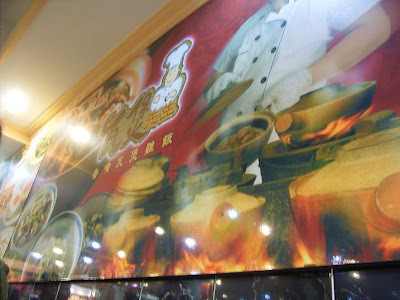 It will come with a set of the current favourite items, although you should not expect them to offer you a whole range of dim sum dishes like the usual dim sum place ( etc, Jln Ipoh dim sum restaurants) . The servings here are usually sized from medium to small. But their pricing is quite decent too. It doesn't cost you an arm and a leg just to try out Vietnamese Fusion food stuff. And guess what, I have yet to find a negative comment about this restaurant yet. 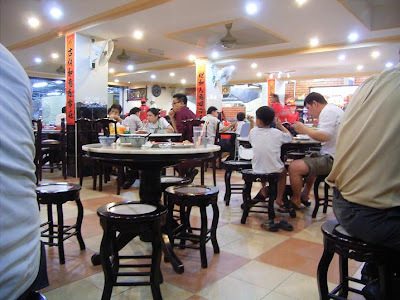 I used to call this place Desa Aman Duck Rice (Ngap Fan) stall when they were still located at the roadside, opposite of Cheras Business Center, simply because they used to have a big duck signage infront of their stall. I have been to this stall countless times, as this place serves some pretty good Claypot Chicken Rice, and also teochew dishes. They moved some months ago, when DBKL decided to move everyone into a new food court complex in Tmn Desa Aman. Surprisingly, they managed to get a shoplot in Desa Aman and there moved there. This is my first time at this place since they moved. It was just a simple dinner, as such we ordered one serving of Claypot chicken rice, some Loh Duck (Loh Ngap), Loh Eggs, and Ham Choi. All very nice to eat dishes I must say. 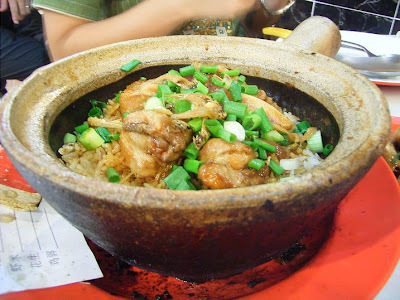 My favourite over here is the Claypot chicken rice. I don't mean to say it tastes astronomically better than every where else, but I must say they're ok, haven't got anything bad to say about their food here. You can also add in salted fish for extra taste if you wish. Below: A pic of their new back drop. Oh yes, I recommend this drink to everyone. Red Bean Ice ( Hoong Tau Ping)... they serve the most pekat Red Bean Ice in KL. For me it is a must have everytime I visit this place... yummylicious !! Drive from Loke Yew towards Taman Cheras ( Yulek). Take the Taman Cheras round about, from KL means to take a left. You will reach one traffic lights, keep right , and turn right. Then you will arrive at the BP traffic lights, there you turn right again. At that point you will be on Jalan Kaskas once you turn right. After a short while the road splits into two ,like a Y, you keep to the right. Follow the road as it bends to the left, and take the first left turning. You should be on Jalan Desa Aman 2, the restaurant is right at the end of the road. If anyone's been listening to the radio or reading the national papers, you would have heard of this Malaysian kid studying abroad in Taiwan, who allegedly insulted our Country. I only just recently went up to Youtube to watch the entire video and I thought, the mofo is quite funny, and he got his facts quite right about most of the stuff he was rapping about.. I gotta say, he made a big mistake by making insinuating remarks about the "Azan". Nevertheless, he has now moved on , after making his video apology also on Youtube, I just saw this new video clip of his. So what do you think ? This fler is talented right ? I think he is talented, but unfortunately stupid. Anyways, good luck to NameWee, should the Malaysian law decide to take further action. This Wong Kok, is strategically placed, right opposite of Fitness First, at Leisure Mall Cheras. Sometimes after class, on Sundays, we may end up at this place for a drink and a quick bite. Now you see why I am quite puzzled as to why these CCT's are always filled with people ? My theory is that, they serve really simple food, which tastes quite okay. I mean how bad can you fry a piece of luncheon meat ? or How bad can your Maggi Mee be ? Oh yes, I remember something really good to mention about this place. Their Coffee, Tea, and Cham tastes really quite good. I mean they have a recipe that appeals to the general public. I mean you can't complain about their coffee, unless you are comparing them with Starbucks' coffee. Then of course, its value for money in a pretty decent environment. Nowadays, after we finsih combat at Uptown, we will surely try to find some food within the area of Uptown 5. Hence, the increased frequency of eateries we frequent around DU / UPtown area. Yes I was on one of those Char Koay Teo rampage, where I went try different CKT at different places. We ordered Fried carrotcake and CKT from this place. While filming the video (che WA !!) the auntie came and talk to me. Telling me how long they been frying their koay teos. Since before there was UPtown , they had a stall by the roadside, until today, they already have two grown up sons. Now helping out in the stall also la. The auntie kept telling me, their CKT damn nice la , this la that la... So finally the Char Koay Teo arrived. FYI, this CKT has got no pork, or lard,. I only found that out after the first bite.. then only I noticed, in UPtown... Mamak and Malay stalls open side by side with the chinese stalls, so have to serve no PORK lo. 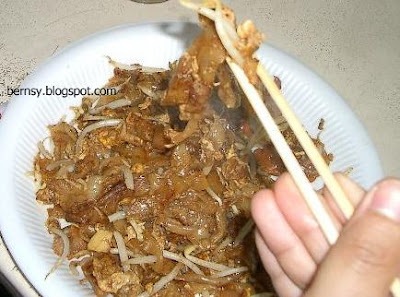 Anyone tried Teochew Char Koay Teow ? 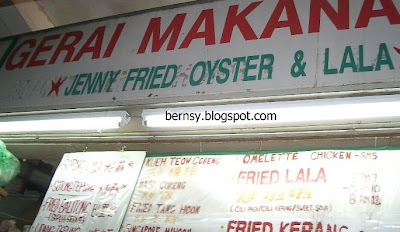 It must have been one of the weirdest thing I've seen, when I first saw this stall @ Jalan Imbi (opens only for dinner). 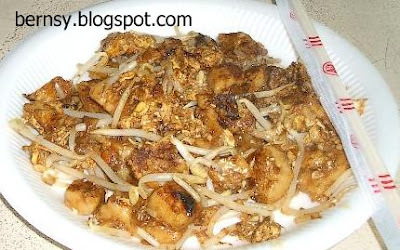 After trying so many CKT's in Penang, I really am trying to find a subsitute for CKTs.. in KL. To be frank , I have not been to these stalls for a few years now. But luckilly for me the Teochew Char Koay Teow stall is still around. I had a few words with the lady frying the good stuff, and she told me, that they have been there for 38 years. Needless to say, she must be the second generation frying Koay Teow in this same spot. We also ordered Fishball Noodles from a stall in the same place. We waited quite long for our CKT to come. Long ? Yes, considering the fact that most CKT's are cooked in within 2 - 3 minutes, depending on how hot they keep their WOK. We waited about ten minutes, and when it arrived , it looked pretty good. When it arrived, it was just fresh off the WOK. The aroma filled the air, but I bet it came partly from the lady's wok. The cockles were large and prominently displayed on top of the plate. We were definitely looking forward to it. Let me explain the difference in Teochew CKT as compared to the Penang Variant, which I think everyone is so used to. Teochew CKT is brown in color, because they use cili padi instead of sambal for their chili. 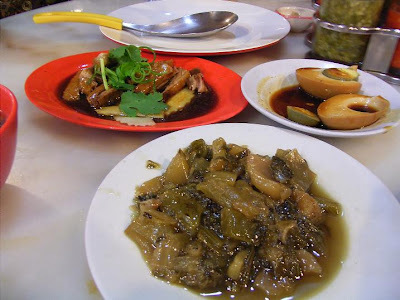 Teochew CKT also has got a type of teochew pickled cabbage ( choi bou - said in cantonese) which is quite normally served as a side dish for Teochew Porridge. Its definitely a different version of CKT as compared with the ones found in Penang. But I must admit, it wasn't the best CKT I have had. Definitely worth a try, to check out the Teochew version. Next up, our Fishball Noodles (kon lou). If you are looking for something simple, and clear I think I'd recommend this. Nothing special in particular, even the fishball and stuff in the other bowl below is normal. For me it tasted , ok la only. Nothing much to shout about. On a short note, as we were leaving the stalls, I bumped into a friend who was also eating there. I noticed he ordered some ikan bakar which looks enticingly good... Oh ya one more thing, there is a new Penang CKT stall recently opened in this area.. that makes two CKT stalls in one area. 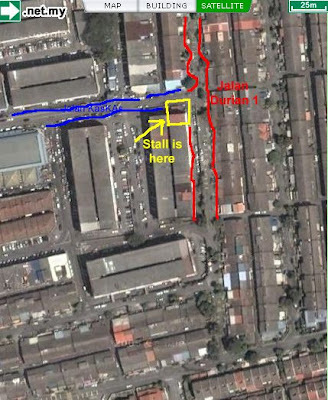 This one is Teochew, situated right in the middle of the area, next to the Yong Tau Foo stall. There are 3 Leong Ya's in the vicinity of Taman Sungai Besi Indah. This one belongs to the daughter, opposite of Azhar Maju Mamak. I must say this Leong Ya is the most packed during lunch and dinner, and yet I couldn't find a single blog review of this place... You should be able to see in the map below the Leong Ya (in black) and Leong Ya in Yellow. There should be another Leong Ya somewhere in the front, with air cond. The way they serve their YTF is slightly different from the ones in Ampang. The sweet sauce is served together, and their chili sauce is slightly different from the Ampang YTF that most people are accustomed to. Unlike Ampang Homeland(got factory to make YTF), these 3 Leong Yas make their own YTF individually. So you might have to sample YTF and Chee Pau Kai ( paper wrapped chicken) in all three branches. Also try their other dishes. I personally like their Vietnamese Seafood Pot , and they also know how to steam fish ( results always better than average). Prices are reasonable too. Sorry no pics for those dishes, but definitely worth the try.